The Coffee cocktail got its name from the way it looks, and not from having coffee in it, or tasting like coffee. 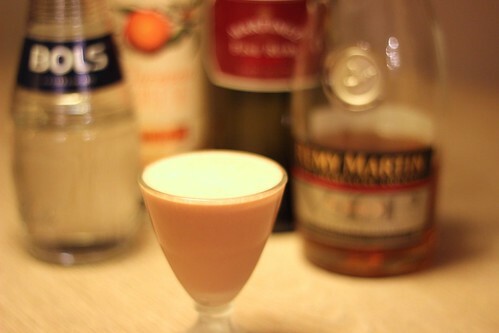 In my last post, for the Clover Club, I talked a bit about eggs, and here’s another one. Though this time we’re using an egg yolk. This is a lot rarer in the cocktail recipes I see today. Egg whites are all over the place, and whole eggs are next, with egg yolk being seen the least. Apparently this recipe in Jerry Thomas’ book, from back from the 1800s, has a whole egg. Either way this is still a nice, if sweet, cocktail. My first thought was “Wow, sweet” with the Lommebogen recipe. I used cacao in the Cafe Royal cocktail, just because it fits in my mind better with the word “coffee” than curaçao. That one isn’t as sweet as the Lommebogen obviously with so little sweetener in it. I actually prefer the sweeter, Lommebogen version though. With the egg in there it just seems to have more flavor with the higher sweetness. I expected the port and cognac to cut through the egg more, but it seems pretty subdued to me in the Cafe Royal, so the sweet kicked it all up in the Lommebogen. (I should also note though that this is the last of five cocktails for the evening, so maybe my taste buds are done for the night.) Definitely something to come back to, and a great use for the egg yolk left over from making an egg white cocktail. I think this is a nice sweet and creamy drink for folks who like those, and I find a lot of people are. Well, if you can convince them that raw egg yolk isn’t weird.